With features District 9 and Elysium under his belt, Neill Blomkamp is one of the rising young visionary directors in science fiction (even if his last outing did leave some flat, it’s a gorgeous picture to look at). Using the genre as social allegory is key to his approach and aesthetic, and that’s sure to figure into his next film, Chappie. Now we’ve got a banner poster, a one sheet that gives us our best look at the title robot, and be sure to stay tuned tomorrow, as the first trailer is slated to drop into our laps. 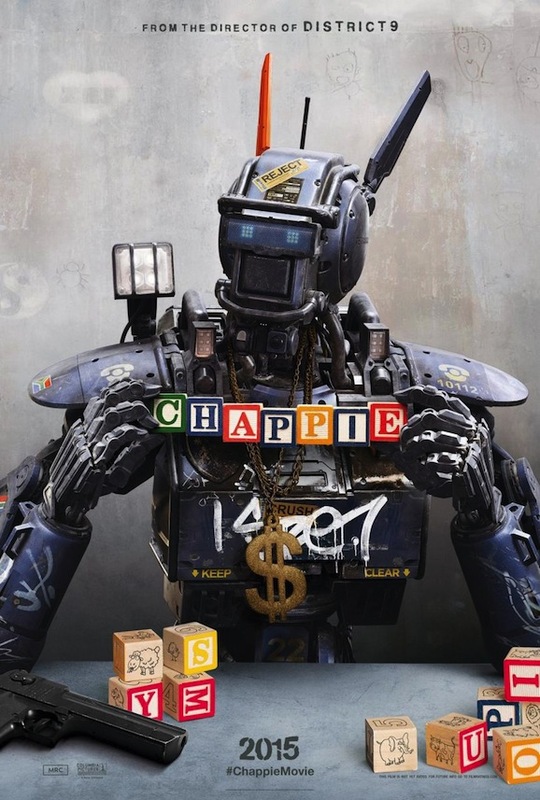 Tonally, Chappie is going to be something of a departure for Blomkamp. His previous two films are both rather serious affairs, but his next reportedly has more of a comedic streak, though it is still sure to feature much of the director’s celebrated action chops. Just expect more laughs, which, aside from some moments with Sharlto Copley in District 9, haven’t figured very prominently in his body of work. Based on Blomkamp’s short film, and written by him and his wife, Teri Tatchell, the story follows Chappie after he is kidnapped at birth and joins an unusual, dysfunctional family as their gifted, one of a kind, adopted prodigy. And yes, he’s still a robot, so it’s going to be a curious adventure to see how all of this plays out. I don’t know what a robot birth will look like. You can see the childlike scribblings in the banner posters above, as well as in some of the earlier art we’ve seen from the film. There was some marketing art floating around San Diego Comic-Con last July, thought the film didn’t have much of a presence beyond that, and we got our first look at Chappie. But that was from the back, and this new full poster gives us a full frontal glimpse, and he looks pretty damn cool. Blomkamp has put together an impressive cast. He once again teams up with Sharlto Copley, and The A-Team star plays Chappie in a motion capture suit, which will be an interesting thing to behold. Hugh Jackman, Sigourney Weaver, and Dev Patel also star, as do South African rap/rave duo Die Antwoord, Ninja and Yo-Landi Vi$$er. From the plot description, the sinister scrawled art, and knowing what we know about Die Antwoord, it’s easy to guess that they’re the kidnapping duo slash strange parental unit. Just that tag on his chest is a pretty good indication. After all, when Daddy has a machine gun and that evil look in his eye, you’re well aware that he’s not your run of the mill suburban father. I imagine Chappie’s life doesn’t have many soccer games, piano recitals, and usual kid stuff. Then again, he’s also a robot, which is largely going to preclude a normal childhood anyway. Here’s Blomkamp’s short that serves as the inspiration. It should give you a good idea of the feel of the film, as well as how the robot moves. Chappie opens everywhere on March 6, 2015, and keep and eye out for the first trailer tomorrow. We’ll get it up as soon as we can.